WW III for a change? Barack Obama’s main military adviser said today the US does have a plan to attack Iran should it become needed as a means of stopping the Tehran regime from acquiring nuclear weapons. 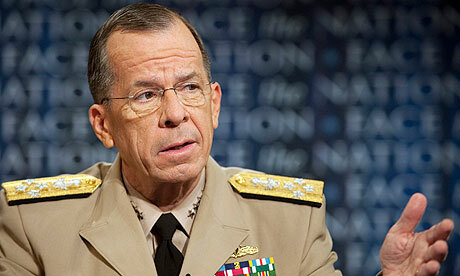 Admiral Mike Mullen, chairman of the joint chiefs of staff and the country’s highest ranking officer, was asked by Meet the Press on NBC whether the military had a plan to attack Iran. “We do,” he replied. Mullen’s comment was a rare admission on the part of any senior figure in the US government that plans have been drawn up for possible military action against Iran. The normal wording of disclaimers from those within and around the Obama administration is that “all options remain on the table”. He fell far short of suggesting there was any appetite on the part of the US for taking on the leaders of Iran in open conflict. He said it was unacceptable for Iran to obtain nuclear weapons, but he said that equally he would be “extremely concerned” about the prospect of a military engagement. Striking Iran could have “unintended consequences that are difficult to predict in what is an incredibly unstable part of the world”. The US approach to the threat of Iran developing the bomb, in line with that of the UK and France, has been to apply increasing pressure on Tehran through sanctions in the hope that it will bend to international will and suspend its uranium enrichment programme. “I am hopeful it works,” Mullen said. The UN in June imposed the toughest round of sanctions on Iran yet, targeting Iranian banks and export businesses. The move was followed by an even sterner set of restrictions from the EU, including a block on oil and gas investment in the country. Shortly after the announcement of new sanctions, Tehran responded by saying it was ready to talk again about a possible deal in which it would swap its uranium for already enriched material that could be used in a civilian energy programme but would not be capable of conversion into a nuclear weapon. The Iranian regime has always denied that it has any intentions to produce a bomb.